I met Ryan Hunter (who's real name is Robyn Heirtzler) at LDS Storymakers 2011. In fact, she was the first person I met, which meant a lot to me because it was my first writing conference and I felt WAAAAY out of my element. Through a twist of fate, we ended up being critique partners. Okay, enough about me. Let's get to know Ryan Hunter! 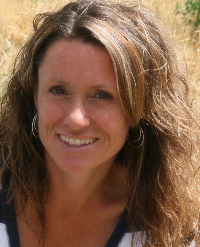 You can learn more about her and her writings by following her blog: Ryan Hunter's blog. JD: First, start off by introducing yourself and your books. Ryan Hunter: My name’s Ryan Hunter, but I think you already covered that in the intro. I’m the mother of five awesome children; an airman, a genius, a BMX addict, a zombie and an angel. I’m also married to a patient man who finds me time to write and even sends me on the occasional writing retreat when he realizes it’s needed, for his sanity or mine … I haven’t quite figured that one out yet. I’m an avid runner (it keeps me sane), I love to bake (it keeps me smiling), and of course I write (it fulfills something deep inside of me in a way I can’t explain). I’m the author of two novels, Premeditated, the idea for which woke me in a panicked sweat; and inDIVISIBLE, another novel born of dreams and impressions that haunted me relentlessly day and night. JD: What inspired you to get into writing? RH: I had an idea stuck in my head (not a very good one) that I had to get out. I could find no other way to relieve the pressure than to start typing it out on the dinosaur of a computer that I owned at the time. I finally gained enough courage to “come out of the closet” and admit I was a writer. I sought help from a bestselling brother-in-law and instead of asking me if I was crazy, he actually encouraged me to pursue it. He’s helped me nonstop throughout my adventures in writing. It’s been about 15 years since that first terrible idea and now I actually have good ideas and love to write them and share them! JD: Are you working on another writing project? If so, care to share? 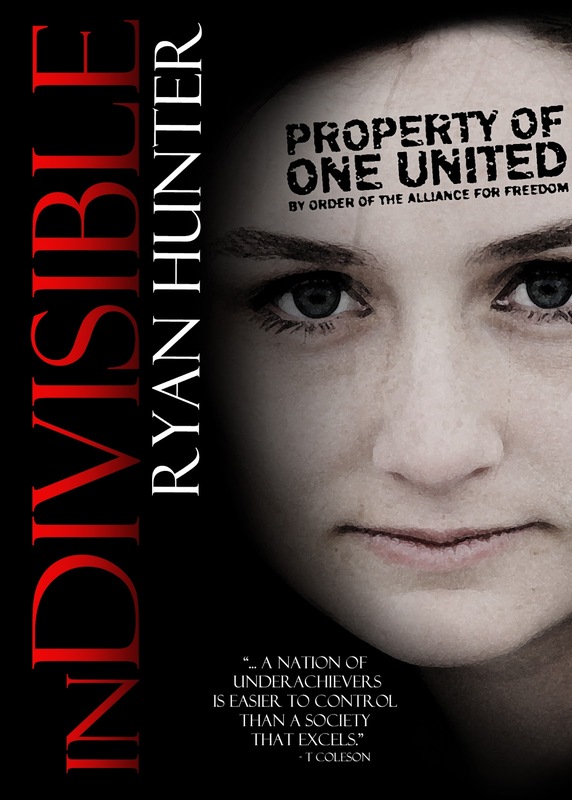 RH: I’m working on book two of the One United Series (inDIVISIBLE was book one). It’s exciting and daunting and I love every minute of it! I can’t wait to get the new characters engaged in the story and introduce them to my readers. I’m hoping book two will even gain me the forgiveness of some of the my readers who’ve haunted me since finishing book one. JD: Would you have any advice for new writers? RH: Never stop. That’s the advice I was given and it’s exactly what I needed. I actually wrote and published two novels under my given name, Robyn Heirtzler, and considered quitting a few times because of other stresses, but I’m grateful I didn’t. I feel inDIVISIBLE is my most powerful book to date and I’m excited to see where I can go from here. So, keep going. Keep writing and you will only see your work improve. JD: Why do you write by the penname Ryan Hunter? RH: I write as Ryan Hunter because the books published under Robyn Heirtzler are religious-based. I wanted to write under a name that wouldn’t be caught up in that genre. I was ready to branch out into a new market and a new name seemed a logical choice. Also, and probably just as importantly, do you know how many people can actually remember, let alone spell my given name? It made finding me or my books nearly impossible. JD: What book are you reading now? RH: I’m currently reading The Magic of Thinking Big, an awesome self-help book; and I’m about to start Amusing Ourselves to Death, because of a recommendation; and Delirium because inDIVISIBLE has been compared to Delirium in reviews and I’m curious now to see what it’s all about. JD: Why have you chosen self-publishing over traditional publishing? RH: I’ve taken the traditional publishing route before but just felt I’d prefer to maintain more control over this book. I’d also spent a lot of time helping other self-published authors get publicity and the right marketing, so I figured I had enough experience to make it a successful venture. It’s nice to have control over your own book. JD: What advice do you have for people looking to self-publish? RH: Start marketing before you begin writing your book. You must have a web presence long before the release date to get the initial publicity that’s necessary to sell many copies. You’ve also got to look and act professional. This includes your editing, formatting, cover design, website, etc. Look second-rate and people will dismiss you and your book without taking it seriously. There are too many self-published books that disappoint. You don’t want to be one of those, so take the time to make your finished work look professional. Also, conduct yourself in a professional manner online, meaning, take yourself seriously as a writer. Promote your work but NEVER spam people, present yourself as an authority, make friends of other writers and compliment others when they’ve written something worth reading. JD: Tell us about inDIVISBLE. RH: inDIVISIBLE is a story of self-discovery, freedom and hope. 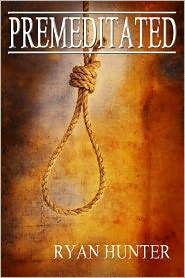 It follows Brynn Aberdie and T Coleson on a journey to escape an Alliance kill list to not only save their own lives, but to help free the people entrapped in the society of One United. inDIVISIBLE is a novel about a future with no freedom. The government brainwashes children during school classes, people are monitored by tracking devices and those who excel are punished. Many people have called it a modern-day 1984 that’s actually fun to read. JD: What inspired you to write this book? RH: inDIVISIBLE was inspired by a disturbing dream and a series of subsequent impressions that left me feeling as if every thought I had and every word I said were dictated, like I had no freedom to even utter my own opinion. It was vivid and consuming, so I started typing and had the basic plotting for three novels done within a day. JD: What was the hardest part of writing your book? 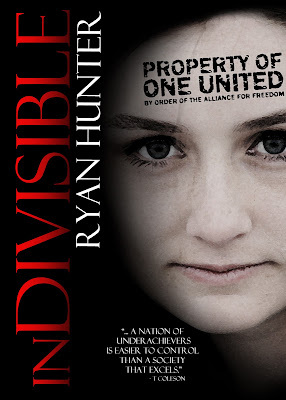 RH: I wanted to write inDIVISIBLE without being influenced by the media, current events or other dystopian novels. So, I distanced myself from the news, reviews of other books, talk of politics and anything else possible until I’d finished my first draft. I’m also not a very big political person, so it was hard to write a book that turned out like this without that background, but I also think it makes it more real and engaging. It was never meant to be a political statement anyway. JD: You've got a unique cover, since that is your daughter. What was it like putting that together? RH: I loved using Joni as the cover of inDIVISIBLE. I worked on my cover for a quite a while, using other images until I pulled out a folder of Joni’s pictures and that one just hit me. It was perfect. I darkened it, added a few effects and feel that it all came together perfectly. I hadn’t realized while writing the book just how much Joni resembled my main character, but I’m glad for it. JD: Did you learn anything while writing this book? RH: I learned to step out of my comfort zone. When I first told my husband about my idea for inDIVISIBLE, he said, “That’s a political book.” I refused to believe him. I told him it was just fiction. He argued the point and I argued back until I couldn’t deny that I had entered the political fiction world. I’ve never been a fan of politics so the idea that I was writing something like that intimidated me and made me really stretch to make it real and engaging. I decided to just let the impressions through and the ideas that inspired it to take over. I’m quite happy with the results. JD: If they made this a movie, who would you like to see playing Brynn, her Mom, and T? Do you have a director in mind? RH: I honestly have no idea. Awesome people because the characters deserve that much. Awesome, I want to go buy and read inDivisible! Thanks for having me on your blog, James! You are awesome, as always! Interesting interview with good info. Thanks. This is a good interview because it succeeds in its main aim, which is presumably to interest us, the readers, in the author as a person and personality. If we are interested in what she has to say, we are likely to want to read her book. So well done! Great interview, James. Sounds like Ryan has some great instincts as a writer, as a reader, and as a human being. As for the accusation of writing a political book for fiction, remember that Don Quixote and Gulliver's Travels were considered political satire when they were written. Great interview, and "inDIVISIBLE sounds spectacular! Good interesting interview - thanks for doing it and sharing. Great interview. And the book inDIVISIBLE sounds like our world today. I just recently stumbled upon this website ~ thrivemovement.com ~ it reveals just how our real world really is and what we are -- mere slaves -- free range chickens if you will. Indeed the book sounds interesting and have a chance to be a best seller. JD sent me and I really feel like something is being promoted sublimal-ly? Fine your blog, James! I like your work! Wow, that was very interesting. :) I read the interview all the way through lol. Very nice. I enjoyed the read. I will definitely put this new book on my must read list! Great interview, James. And good luck, Ryan! We're rooting for you! !